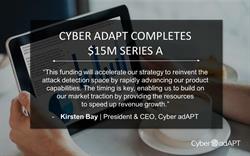 HALF MOON BAY, CA--(Marketwired - May 11, 2016) - Cyber adAPT® announced today the successful closing of an additional $6.0 million Series A financing round with Black River Investments LLC. This funding completes an aggregate financing of $15M. Following successful deployments with government and commercial sector customers over the last year, Cyber adAPT plans to use the proceeds from the financing to expand into core markets. "This funding will accelerate our strategy to reinvent the attack detection space by rapidly advancing our product capabilities," said Kirsten Bay, President & CEO of Cyber adAPT. "The timing is key, enabling us to build on our market traction by providing the resources to speed up revenue growth." With increasing citations by cyber security analysts, Cyber adAPT is pioneering a new approach to security, detecting toxic patterns of network behavior and identifying more genuine attacks before they cause harm. Reuben Richards, Managing Partner of Black River Investments LLC, who will be joining Cyber adAPT's Board of Directors as Chairman said, "We believe Cyber adAPT is a leader in the detection and mobile security segments of the market, and we are delighted to partner closely with this outstanding leadership team. Further, we believe this capital will accelerate the company's move into more dynamic market segments given the inflexion point that security technology has reached. Cyber adAPT is in a unique position to provide the much needed product value to the enterprise consumer." Following the exclusive secure device integration with Mobile Active Defense and the launch of forensic intelligence product 'Cyber adAPT PLUS' announced earlier this year, the company is attracting partners from around the globe, helping to build on an enviable client roster. For more information on Cyber adAPT, visit cyberadapt.com. All statements in this press release that are not based on historical fact are "forward-looking statements." While management has based any forward-looking statements included in this press release on its current expectations, the information on which such expectations were based may change. These forward-looking statements rely on a number of assumptions concerning future events and are subject to a number of risks, uncertainties and other factors, many of which are outside of our control, which could cause actual results to materially differ from such statements. Such risks, uncertainties and other factors include, but are not limited to, the fluctuation of global economic conditions, the performance of management and our employees, our ability to obtain financing, competition, general economic conditions. Furthermore, we operate in a highly competitive and rapidly changing environment where new and unanticipated risks may arise. Accordingly, investors should not place any reliance on forward-looking statements as a prediction of actual results. We disclaim any intention to, and undertake no obligation to, update or revise forward-looking statements to reflect events or circumstances that subsequently occur or of which we hereafter become aware. About this company Cyber adAPT, Inc.